A typically buttery chocolate coloured, though larger brownie, from Lake Poerua. 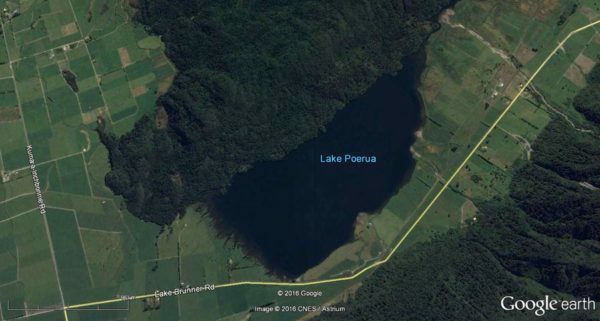 Lake Poerua is a small, shallow lake, located 13 km from the West Coast’s most popular fishing and boating location of Lake Brunner. There is plenty of accommodation in Greymouth 59 km by road from Lake Poerua. Accommodation at Lake Brunner Lodge. There is also a good camping ground, Lake Brunner Motor Camp, at Moana 24 km away by road. Measuring approximately 900m at its widest by 1800m in length the lake is often unwisely neglected by passing anglers. The lake is only 5 or 6 metres deep at most. The water although clear is tea stained making fish harder to spot. The big brownies found in Lake Poerua are mostly a buttery brown colour sometimes almost black to match their surroundings. Some twenty years ago I would travel to the annual trout fishing competition held in the area and hosted by the Lake Brunner Hotel. Perhaps surprisingly many of the biggest fish entered in the competition would come from Lake Poerua rather than the much larger Lake Brunner. Although Lake Poerua is a fairly small lake, like practically all West Coast lakes, shore based fishing is difficult, if not impossible around most of it’s shoreline. Think bush and swampy shallows mean the lake it mostly fished from boats. All three fishing methods, fly, spin and bait are permitted at Lake Poerua. Many of the fish taken by anglers are taken trolling, or harling, with Tasmanian Devils or perhaps a black Toby. 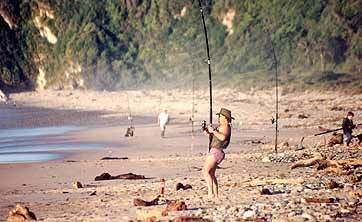 If the trout are playing hard to get try casting or trolling a brown or grey Woolly Buggar as this pattern is usually deadly on the Coast. 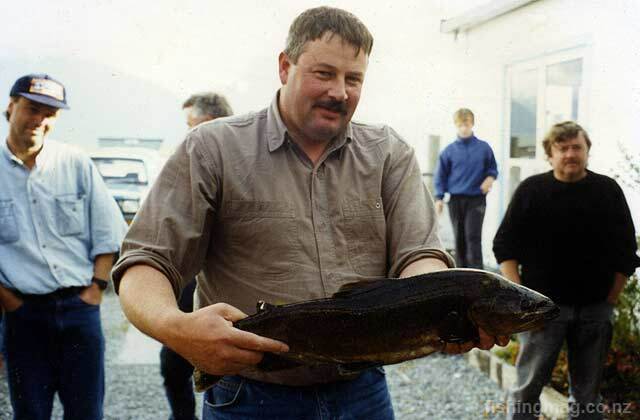 According to West Coast Fish & Game the brown trout in Lake Poerua average 1.8 kgs. West Coast Fish & Game Regional Access brochure pdf. The fishing season duration for Lake Poerua is 1 October to 30 April. The daily bag limit is two trout and there is no fish size limit. Brent Beadle Fishing Guide. You can spin and fly fish the lake from the shoreline to the left of the boat ramp on Lake Brunner Road, but as mentioned a boat is a huge advantage. The water is shallow on the southern side. A small row boat or kayak makes it possible to get to all the difficult places that are inaccessible on foot. There are plenty of tree stumps and logs and the like just beneath the surface in parts of this lake so be sure to exercise a degree of caution to avoid whacking your propeller. These old tree stumps add to the excitement when a fish is hooked so it doesn’t pay to fish too light a tippet. The lake is deeper on the northern side close to the bush clad Mount Te Kinga. The Poerua River drains Lake Poerua at its northern end. This river, in turn, flows into the Crooked River which feeds into the eastern side of Lake Brunner. The best fishing in the Poerua River is where it widens at the Crooked River end and is better suited to the fly rod. Lake Poerua fishes best early season before Christmas after which the water heats up and the fish become a bit harder to catch. Don’t be put off by the relatively small size of Lake Poerua compared with its much larger neighbour. Especially if you have a boat or kayak as it is well worth the effort to put a line in the water. The lake contains brown trout only. They are generally in good condition, have bright orange flesh, and are good eating. Sockeye salmon and rainbow trout were tried in Lake Poerua back in the 1980s and 1990s but failed to establish. 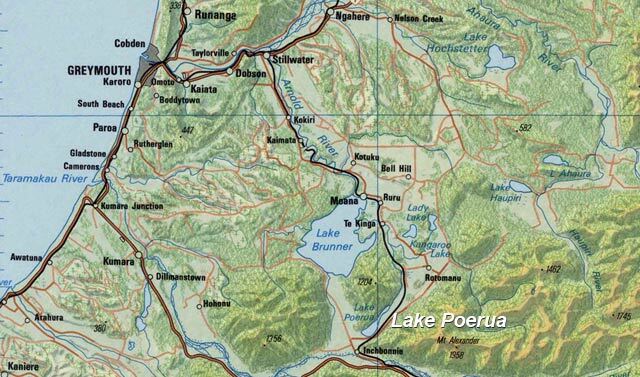 There have not been any further releases into Lake Poerua recently according to Dean Kelly, Manager of West Coast Fish and Game. Walks in the Lake Brunner area Department of Conservation brochure pdf. Lake Poerua is located 24 km by road from the small village of Moana, located at the northern end of lake Brunner. Map LINZ. Crown copyright reserved. Lake Poerua. There is a launching ramp at the southern end of the lake where it meets the Lake Brunner Road. Click map to enlarge. Map courtesy of Google Maps/CNES/Astrium.